May 9, 2018 – CITY OF INDUSTRY, CA – Acorn Controls has released a new product to control the recirculating hot water systems in buildings – Acorn BASyC™. 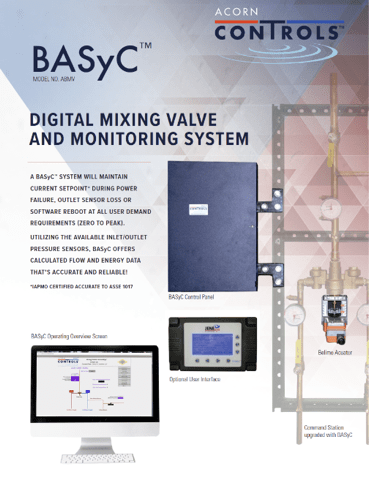 A new flyer is being released to promote this product, which is a digital mixing valve and monitoring system that will maintain current setpoint temperature during power failure, outlet sensor loss, or software reboot at all user demand requirements. The system monitors temperature, pressure and flow, generates alarms and alerts for up to 11 temperature and pressure parameters, and has a sanitization cycle that can stop the spread of Legionella bacteria. In addition, Acorn BASyC can generate reports in a variety of file formats, and the system is accessible without special software for ease-of-use. To learn more about the Acorn BASyC™ system and download the promotional flyer.